Preheat oven to 350°F. Lightly spray the inside of a bundt pan with cooking spray and set aside. Divide biscuits into 16 pieces. Cut each biscuit into quarters and place in a large bowl. Pour melted butter over biscuits and toss to combine. Add sugar and lemon zest and toss to combine. Place biscuit pieces in bottom of prepared bundt pan. Bake 20-25 minutes or until dough is a deep golden brown and baked through. Remove bundt pan from oven and let cool 10 minutes. Carefully invert pan onto a plate. Whisk together powdered sugar and lemon juice to make a glaze. 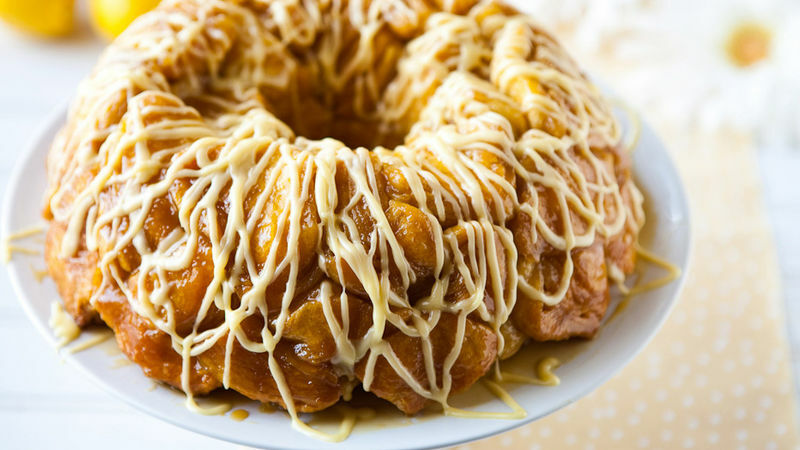 Spoon glaze over monkey bread and garnish with lemon zest. Serve warm or at room temperature.